Members of the first National Advisory Cancer Council at the groundbreaking ceremonies at the NCI's building 6 in June, 1938. 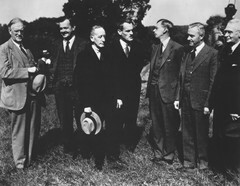 (Left to right) Francis Wood, C.C Little, James Ewing, Arthur Compton, James Conant, Thomas Parran, and Ludwig Hektoen. This new building, erected on land donated by Mrs. Luke J. Wilson was the fourth to be constructed in the complex that is now the National Institutes of Health. The structure was unique in that year of 1939, with its physical equipment and facilities designed solely for scientific research in a specialized field of science. Building 6 was to house the National Cancer Institute, the first of the nine specialized institutes that would comprise NIH.